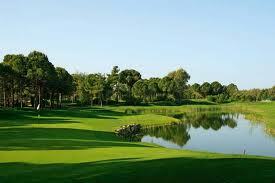 The Pasha Golf course is suitable for all levels of handicap. 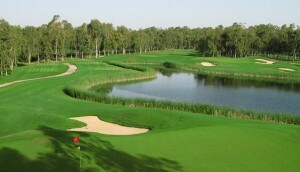 The course is located next to the Sirene and Kempinski hotels and the friendly clubhouse offers the perfect atmosphere. The course, designed by leading architects European Golf Design, together with design consultant and Senior Tour professional David Jones, provides not only a challenge to golfers of all abilities but also wonderful surroundings in which to enjoy your game. At an inviting 6,268 yards par 72, you may think that pasha would be a walk in the woods, but don’t be fooled by the scenery! Tricky dog legs, cleverly placed bunkers and undulating greens will ensure that the more experienced golfer must think over each shot carefully. The shorter length coupled with generous fairways will not unfairly punish the higher handicapper for any wayward shots. Towering umbrella pines, crystal clear lakes and the snow capped Taurus Mountains provide a spectacular backdrop to the course as it winds it’s way through the forests of Belek. The Sultan Course was in February 07 awarded PGA status and is now officially known as the PGA Sultan, it beckons the heartiest of golfers to take the par 71, 7,083 yards challenge. Designed by French golf designer Michael Gayon, an undulated tree lined parkland course with some great challenging and unforgettable golf holes. 4 big lakes and 67 bunkers that play a big role on many of the holes. A true test for every golfer! The PGA Sultan will test the skills of high and low handicappers alike with a combination of different challenges. Carya Golf clubCarya in Antalya’s Belek region is the first classic, heathland style golf course to be built on Turkey’s Mediterranean coast. Designed by Thomson Perrett & Lobb it is a championship golf course set on undulating sand hills and cutting through mature pine and eucalyptus forest, at the heart of Turkey golf courses coast. Thomson Perrett & Lobb has created a classic course, unique to the region, and featuring naturally cultivated heather. 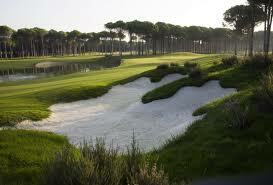 Grown in an extensive nursery on site, Carya’s heather shapes define the course into a truly magnificent spectacle. The course is a demanding test of golfing strategy with free flowing holes that run between pine and eucalyptus trees and across a dramatic sand ridge. Carya also boasts a spectacular new clubhouse and state-of-the-art driving range. Lykia Links Golf, a first in Turkey as well as the Southern Mediterranean; unique!.. Located directly by the sea, it is one of the very special golf courses for professionals known as “Links Course” which takes advantage of nature’s texture. Only 300 of the 36.000 golf courses worldwide are links courses. As with most links style golf courses, the prevailing wind off of the Mediterranean Sea will provide golfers with the challenge they want. The four holes along the Mediterranean Sea – Holes 13, 14, 15 and 16 – are dramatically placed in the dunes and will require skilled shots. Hole #17, with it’s small green and a prevailing cross wind will test even the good golfer. The 18th hole finishes stadium style, with a huge waste area on the right, mounds on the left and a turtle back green that will require the golfer to approach the green with caution. 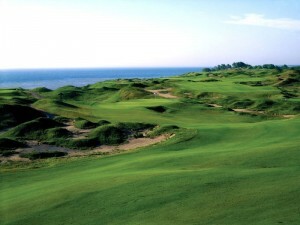 This course will be a challenge for the accomplished golfer, requiring some Scottish style “punch and run” shots.